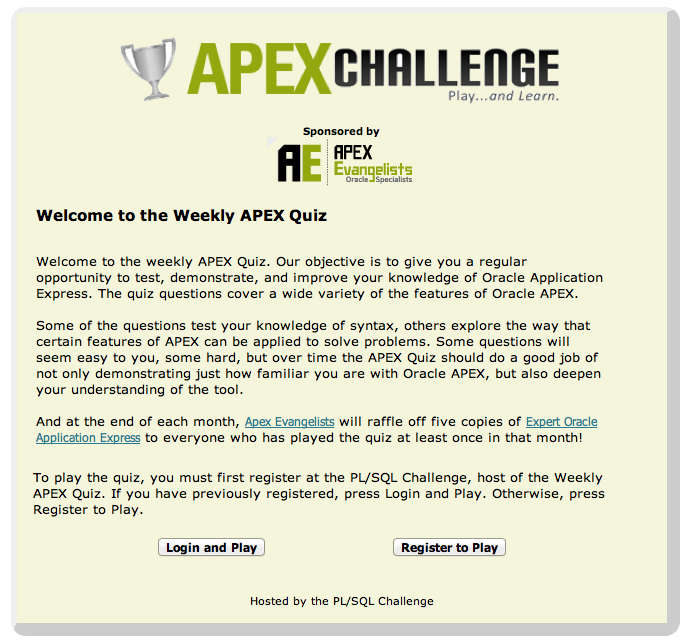 A few months ago we (APEX Evangelists) launched the APEX Challenge, a weekly quiz where you get a question about Oracle Application Express. Next to the fun of answering the questions and see your rank, you will hopefully learn something. To make it a bit easier for the APEX community, to find the site, we looked at a specific url for the APEX Challenge. Before you always had to go to the PL/SQL Challenge and take the APEX quiz from there, which you can still do, but now we enabled http://www.apex-challenge.com too. We also have the apexquiz.com domain, so my question now is: which domain do you like most? Tell us what you like... In a few weeks we will redirect the domain permanently. 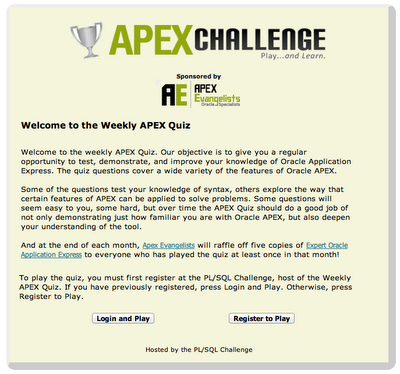 If you have suggestions to make the APEX challenge/quiz better, please share with us too. On April 24, 2012 the Oracle Benelux User Group (OBUG) is organizing for the 5th time in succession, and in close collaboration with Oracle, OBUG Benelux Connect. Possibly you attended in the past and you wish to present your customer case at the upcoming OBUG Benelux Connect 2012 conference. OBUG offers you the ultimate possibility to share your personal experience with other Oracle customers within the Benelux. OBUG Benelux 2012 will be held at the MECC in Maastricht, the Netherlands. This is an excellent venue that provides its guests with the very latest amenities in a strikingly professional ambiance. The MECC is located in Maastricht, 10 minutes from Maastricht Central Station with train connections to Amsterdam and Brussels and a 3 minute walk from the train station Maastricht-Randwyck. Maastricht is a very popular destination for congress visitors, because it is such an intimate place and the city has much to offer. Extend your Horizon is the theme for OBUG Benelux Connect 2012. The strength of OBUG Benelux Connect is the customer cases presented by our members and other Oracle customers: Learn from peers to maximize the value of your business-critical applications and technology. In over 40 sessions, speakers will share their experiences and business solutions with delegates in different streams, which gives them the possibility to investigate other products, extending their horizon. There are streams for Applications (Oracle eBS, Peoplesoft, Siebel, JD Edwards, Primavera), Technology (DBMS, JDeveloper/ADF, APEX, ...), Middleware (BPEL, SOA, EAS, ...) and Intelligence (Hyperion, OBI, GRC, ...). The crowning touch is that the Oracle user experience team will fly in from the USA again to conduct several onsite User Experience Sessions, where delegates have the ability to contribute to and influence product direction and design for Oracle’s next-generation products. OBUG is looking for end-users, project leaders, implementers, IT and functional managers, CIO's to share their experience with Oracle products in a 45-minute presentation – (slides in English, presentations preferably in English). If you can make a valuable contribution to the success of our conference, please complete the online submission form on the OBUG website before December 9th, 2011. If you have any questions, please contact Chris Coolen, Executive Director Oracle Benelux User Group, as soon as possible by e-mail or by phone +31620677597. The organization will make a selection from all contributions based on main criteria such as quality and diversity. Also membership of the OBUG, user or partner, will be taken into account. Speakers will receive a notification of our decision in week 2, 2012. 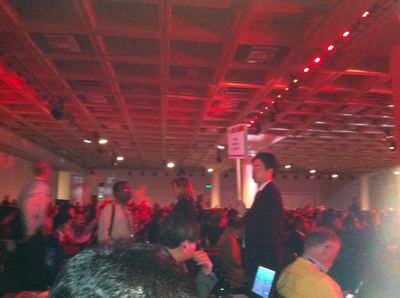 Last Oracle Open World Martin (Giffy D'Souza, left on the picture) told me he was running for the ODTUG board and without a doubt, I told him I would support him. I know Martin for some time now; we first met in 2008 when we did a project for the company he worked for at that time. 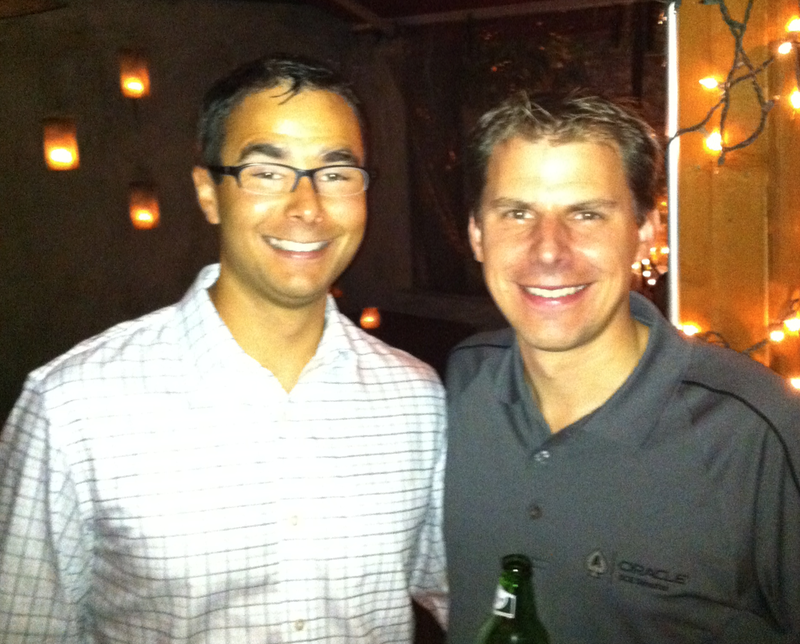 From the very first moment I appreciated his personality and technical skills. 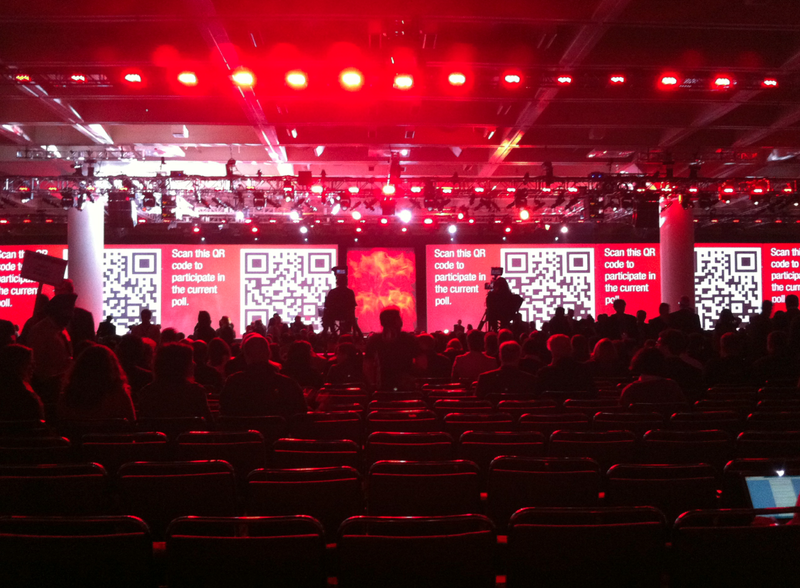 Over the years Martin became more active in the APEX community; on his blog he shares his experiences, he helps people in the forum and presents at different Oracle conferences. In the beginning of the year I nominated him to become an Oracle ACE which was accepted. He not only got that recognition, he also got the best presentation award at ODTUG's conference this year. Hopefully 2011 will bring him one more award... a place in the ODTUG board. I hope the whole APEX community shares my feelings when I say: "Vote for Martin and get him in the board!". Being APEX as one of the main tracks at ODTUG I think it only makes sense to have an APEX representative in the board and I can't think of a better person than Martin. His personality makes the difference! You can read more about Martin's campaign and his reasons running for the board on his blog. All the best Martin! I hope you make it. On Tuesday we had our 6th APEX Meet-up at Oracle Open World (OOW). It was another great time to have some fun and chats with other people developing and using Oracle Application Express applications. This is just one of the picture, you find more pictures here. If you were at the APEX Meet-up and have some other pictures, please send them to me and I'll add them to the album. 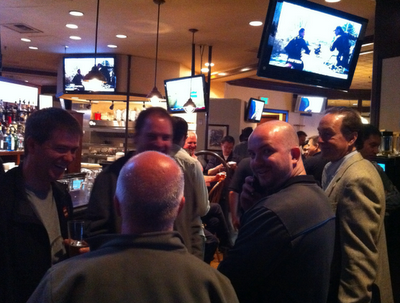 Special thanks to OTN, ODTUG and the APEX Development team to sponsor the meet-up. Although we were with many people, the costs for drinks and appetisers where covered by the sponsorship! Thanks again. 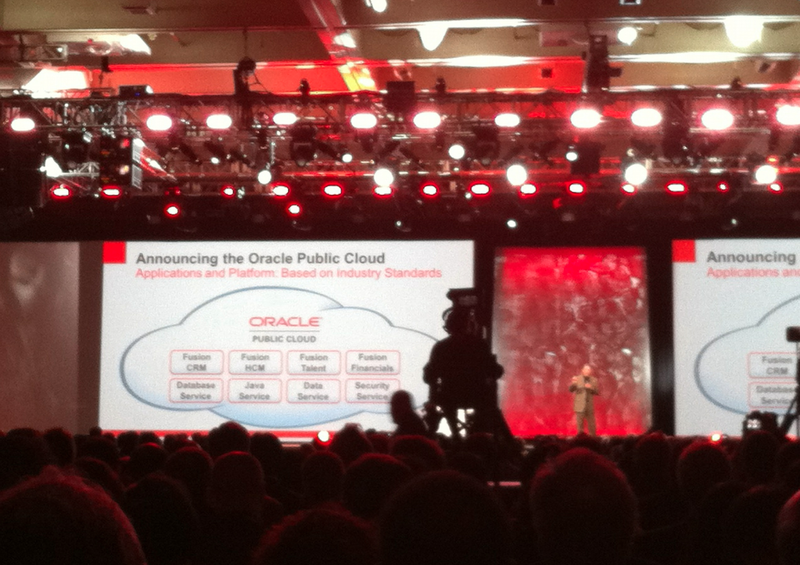 With today's announcement of the Oracle Database Cloud, it also means Oracle gives a strong message towards the APEX community. 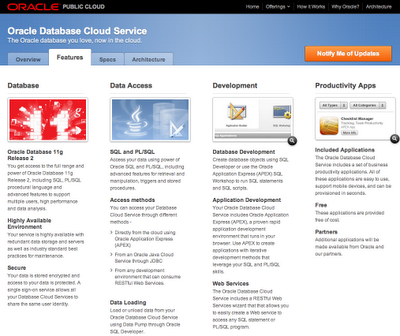 Oracle Application Express (APEX) will be included in the Database Cloud. 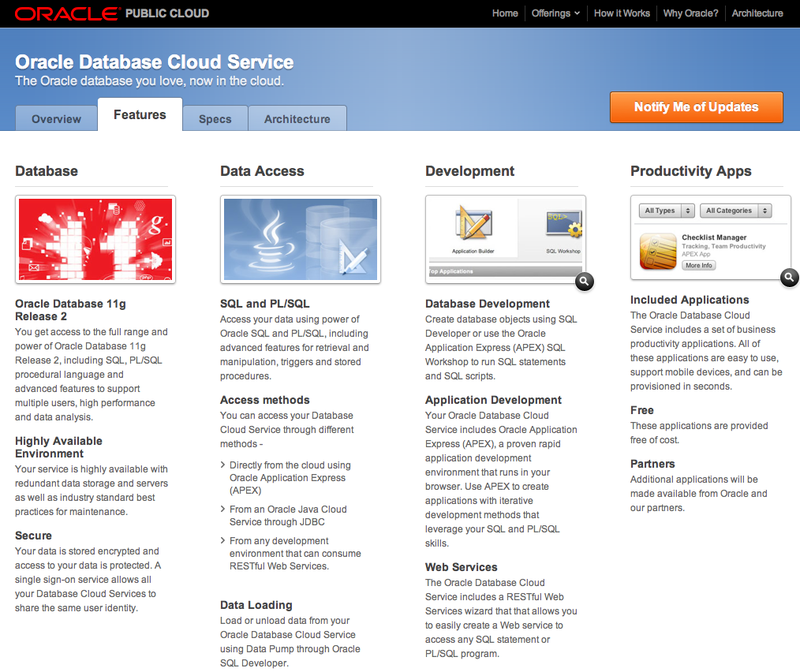 If you look at the features of the Database Cloud, for development it's all APEX and web services (through the APEX listener). 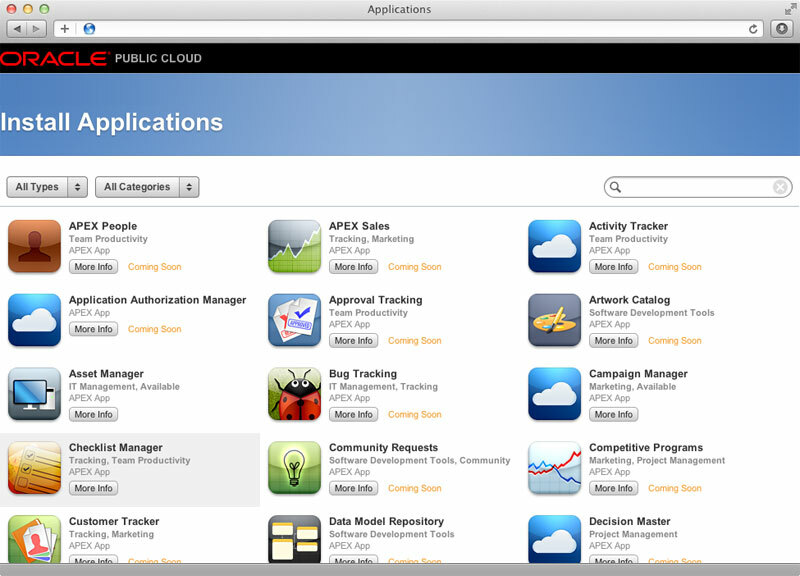 Before we had (and still have) apex.oracle.com where you could try APEX for free, but couldn't install any production applications on it. 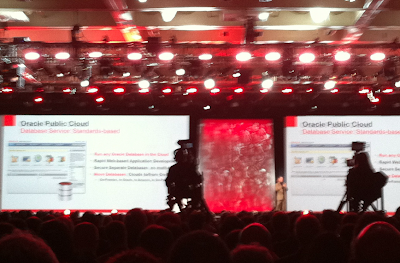 Now with the Oracle Database Cloud you have a paid alternative for all production applications. You can obviously use it for development and test too. The other interesting thing is that there are productivity apps available... it's some kind of an APEX app place which you can install for free. It looks like in the future also partners can offer their apps on there. 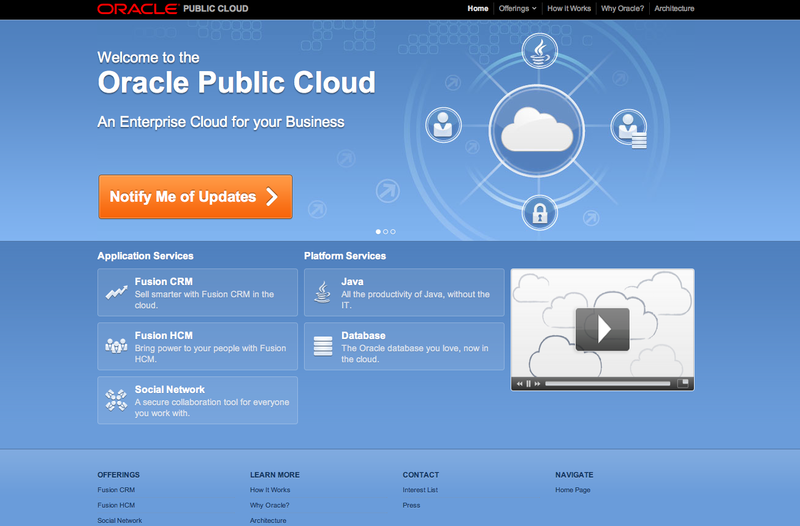 Probably in the next days and weeks we hear more about all the Oracle cloud... one piece that is missing it looks like is pricing. 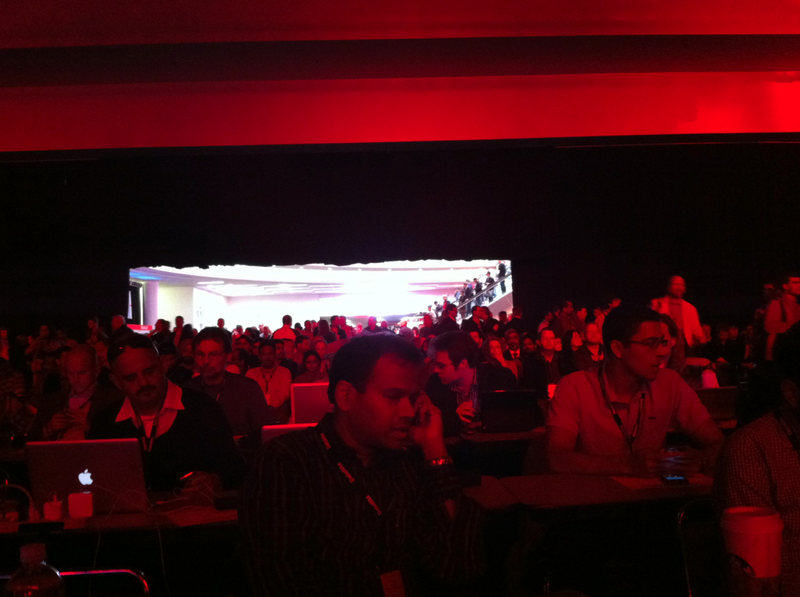 I'm writing this post while the keynote is going on... I'll update this post while we go on. This will be a special keynote for ... :-) You can also follow me on twitter. Mark Hurt on stage announcing Infosys, Larry comes later... won't blog much about Infosys, waiting for Larry. Sting came on stage to tell he looks forward to sing for us at the Appreciation event later today. 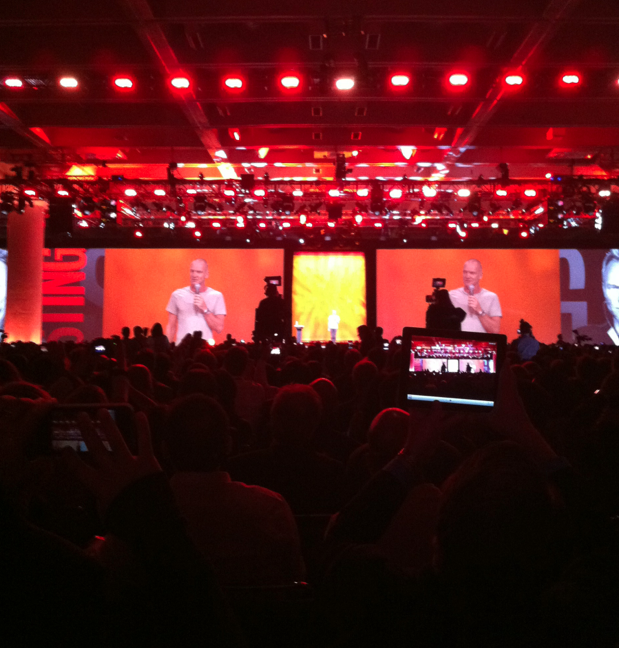 There you go, Larry comes on stage... now it will start to be interesting. 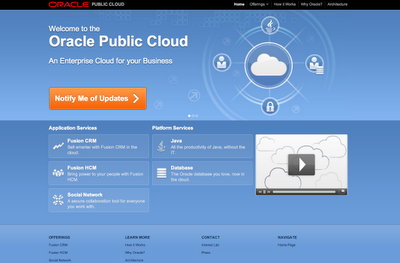 Fusion Applications run in the cloud and on-premise. Important, cloud security: separate VM & database for each customer (no multi-tenancy). 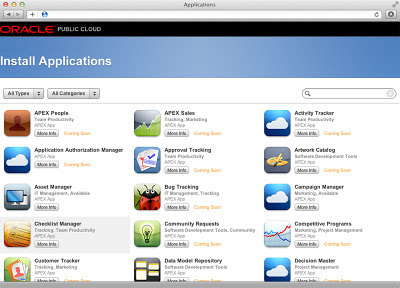 Larry mentions APEX for the first time; people use it in the cloud to build custom applications, some people use it to extend Fusion Apps (or e-business suite). Key difference with other clouds, Oracle Cloud build on standards, can link to anything. 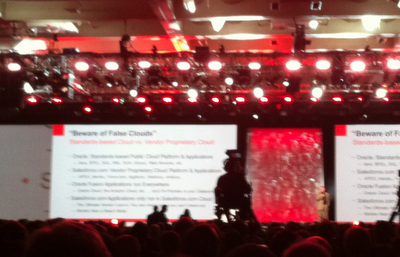 Great jokes of Larry about "False Clouds". Something like "you check data in, but you can't check it out! ", "you take the plane and are in the clouds, but can't get out the plane/cloud anymore". 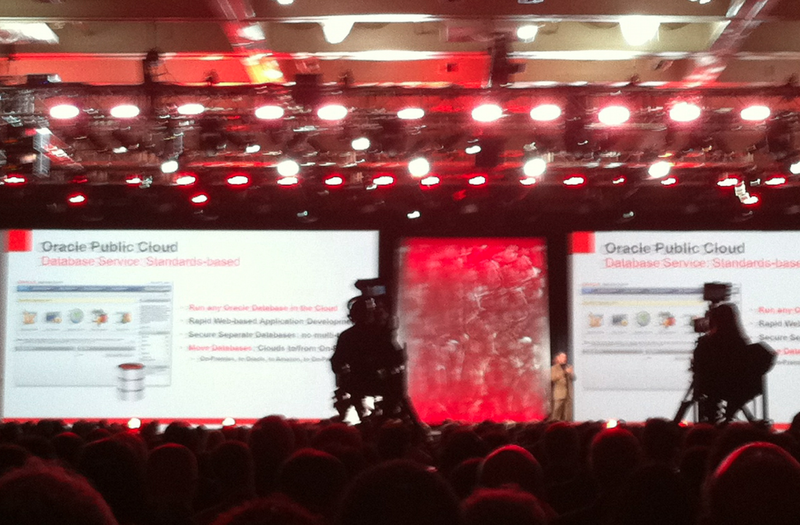 Hacking a lot on Salesforce.com... now Larry is comparing the Oracle cloud vs others (false clouds). 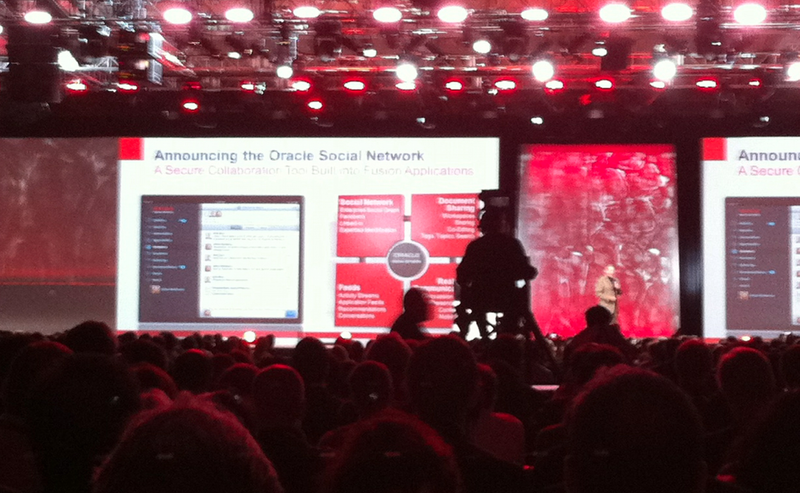 Larry shows a "live" demo of the Oracle Fusion Applications together with the Oracle Social Networking. 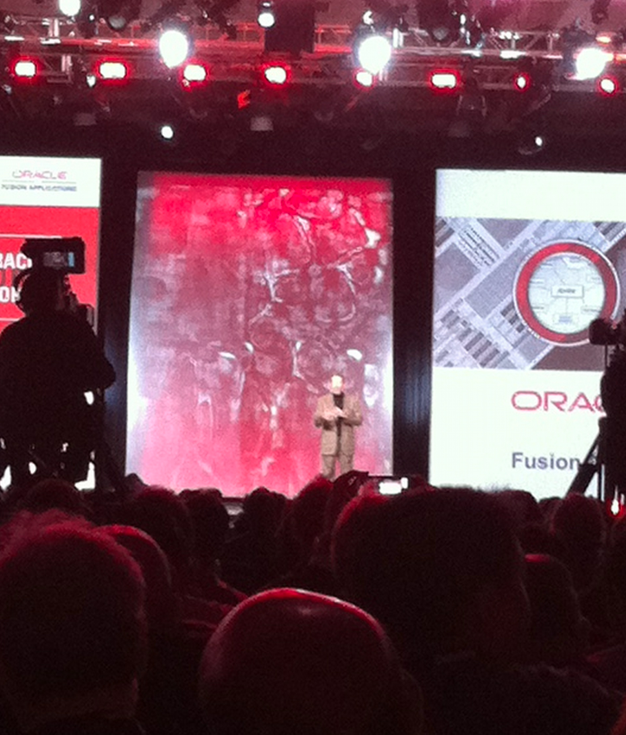 The demo lasts a bit long, but it is nice to see all the nice features in Fusion Apps. Demo done, show over... seems like a strange end to the keynote. 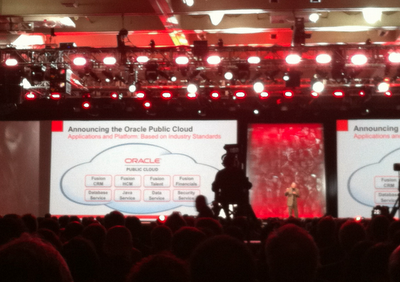 I guess the presentations tomorrow will go in more debt about the Oracle Database Cloud. 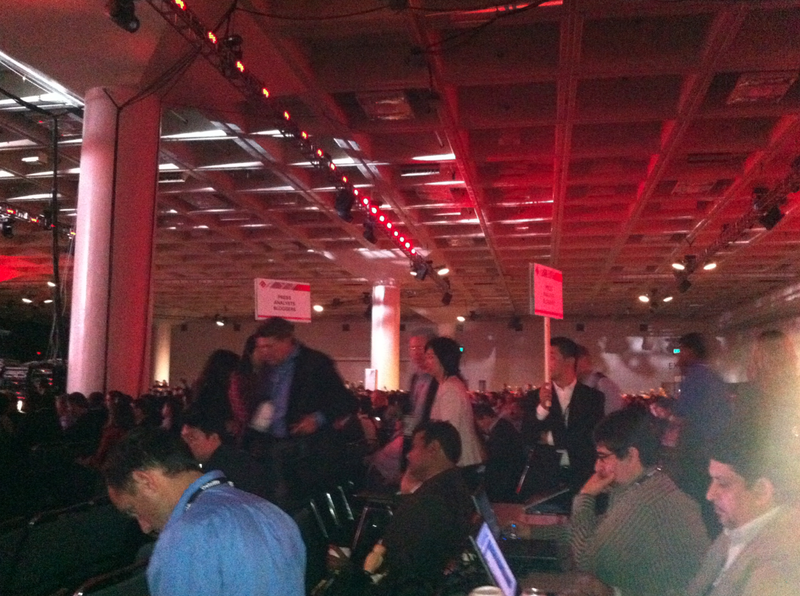 Press (and bloggers) got an invite to a 5PM meeting to Cloud Technical Deep Dive... not sure I'll go there.